Kefir is a fermented milk drink with many benefits to your digestive health because it contains probiotics. Kefir milk is traditionally made by putting kefir grains in cow, sheep, or goat’s milk to create a yogurt-type drink, although nowadays there are versions with non-dairy milks. Kefir drink is good for your immune system, bone health, digestion, and managing symptoms of diabetes. The health benefits of drinking kefir come from the fact that it is full of healthy bacteria and yeasts. These microorganisms help to balance the microbiota in your gut which improves your overall health. Kefir probiotic drink is also virtually lactose-free and is a good source of calcium and other minerals and vitamins for people who are lactose intolerant. In this article, you will find out about what science says as to the proven benefits of kefir and why drinking kefir milk is good for you. Milk kefir has a slightly acidic taste that is similar to yogurt, but a bit stronger. For some people, the sour taste of kefir takes getting used to. However, many people quickly acquire the tangy, yogurt-like taste of kefir milk. You can also add honey, berries, fruits, or other flavorings to give kefir a sweeter taste. Kefir should have a slightly thick consistency – not a thin consistency like milk and not a thick consistency like yogurt. Depending on the fat content and the type of milk used, the consistency of kefir can vary. Milk kefir grains are a lumpy, gelatinous substance that is the starter culture for producing kefir milk. The nutritional benefits of kefir depend greatly on the type of milk used to create kefir. The journal Nutritional Research Reviews reports that kefir generally contains 3.5% fat. Kefir also contains many of the essential amino acids your body requires. Kefir is rich in vitamins, with vitamin C, vitamin A, and vitamin K being the main ones. Because kefir contains virtually no lactose or sugars, many people view kefir as a paleo-friendly drink, and even keto-friendly drink. The main benefits to your health of consuming kefir regularly are due to the amazing array of probiotics and prebiotics it contains. Which is better for you: kefir milk or yogurt? While both of these dairy products contain beneficial bacteria, kefir has a unique and diverse nutritional makeup that gives it an advantage. When compared to probiotic pills, kefir is a much better choice. The main problem with probiotic supplements is that they vary in potency and in quality. Keffir, delivers live active bacteria and it is also high in vitamins and minerals. The bacteria in probiotic pills is not protected and it’s hard to know if it’s viable. One study evaluated the quality of 25 different probiotic supplements. The researchers concluded that “only 2 of the 25 evaluated products were considered acceptable when both the label and contents are considered, something that is of great concern.” The researchers also found that some of the bacteria in the probiotic supplements was inactive and not viable. Let’s look in more detail at how consuming kefir every day is good for your digestion, immunity, weight management, and strengthening your bones. Learn more about lactose intolerance and what dairy-free sources of calcium you can enjoy for good health. Find out about many other natural ways to strengthen your immune system to help fight disease better. If you have diabetes, learn about which foods are good for helping to prevent spikes in your blood glucose readings. You can learn about the other helpful foods for inflammation and how adding these to your diet benefits your health. Find out what natural remedies you can use to help bring down blood pressure and improve your cardiac health. If you are looking for ways to lower cholesterol naturally, you may want to try some of these natural ways. You can get more information on how to prevent osteoporosis and improve your bone mineral density. As well as consuming kefir regularly, you can learn about other natural methods of treating asthma. Kefir is a naturally fermented milk drink that is very good for boosting the condition of your health. Most people enjoy drinking fermented milk products every day without any adverse effects. Another way to improve your digestion and avoid any potential effects of bloating, abdominal discomfort, or nausea is to consume kefir with your meals. Many supermarkets and health stores sell kefir. You can usually find kefir in the dairy product section or yogurt section. Always read the product label to see what it contains. If you can’t buy kefir locally, it is very easy to make your own fermented kefir milk at home. Buy milk kefir grains from a reputable health store or online. Put a tablespoon of kefir grains in a large glass jar. Pour 2 cups of full-fat milk in the jar. Cover with a cloth and leave at room temperature for 24-36 hours to allow the kefir grains ferment the milk. Kefir should have a buttermilk consistency when the lactose sugars have broken down. Strain the liquid into another jar so that you are left with the kefir grains in the strainer. Consume the kefir milk or place in the refrigerator to consume later. You can immediately make your next batch of kefir by repeating the steps above. 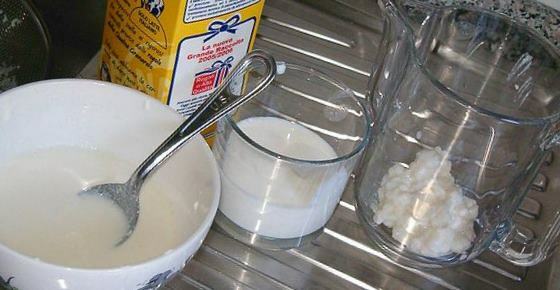 If you plan on making kefir later, cover the grains with milk and store in the refrigerator.